Thank you for your interest in RAVENS-WAY WILD JOURNEYS LLC and our ongoing conservation mission and passion! 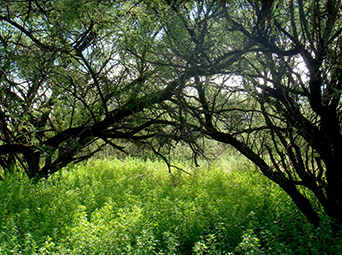 Welcome to Raven’s Nest Nature Sanctuary – our second Sky Islands Nature Sanctuary! 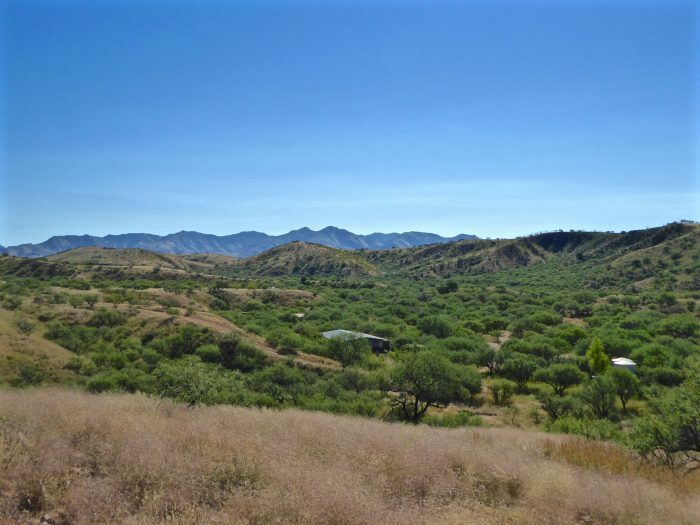 Situated in the heart of Arizona’s spectacular Sky Islands, Raven’s Nest is a private, 42-acre Nature Sanctuary located by 9000 acres of pristine and remote wilderness. 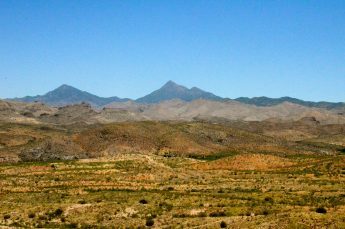 Set in scenic rolling hills tucked between the soaring Santa Rita and lush Patagonia Mountains it is a naturalist’s paradise! 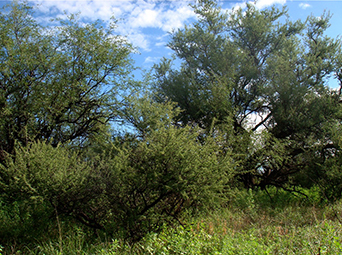 Raven’s Nest Nature Sanctuary is only 75 minutes south of Tucson International Airport and about 3 hours from Sky Harbor Airport in Phoenix. Reaching Raven’s Nest is not only easy, it also ends with a gorgeous scenic drive through spectacular wild areas as far as your eyes can see! 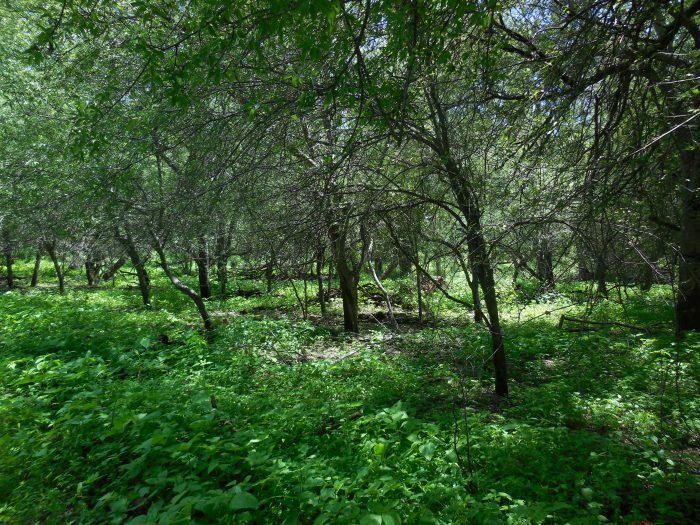 The beautiful land at Raven’s Nest Nature Sanctuary consists of an extensive Mesquite Woodland or Bosque in the lower reaches with intriguing arroyos (dry creek beds) winding throughout. 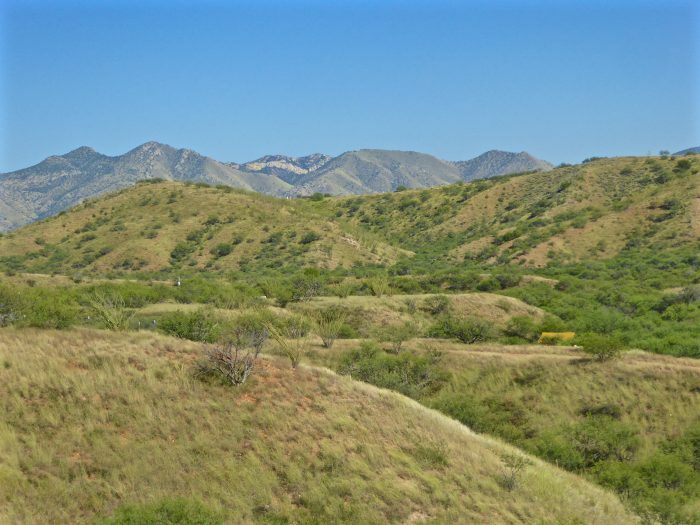 Above the seclusion of the woodlands lie waving Grasslands and Ocotillo stands, providing sweeping vistas of the preserve and nearby Sky Island mountains. 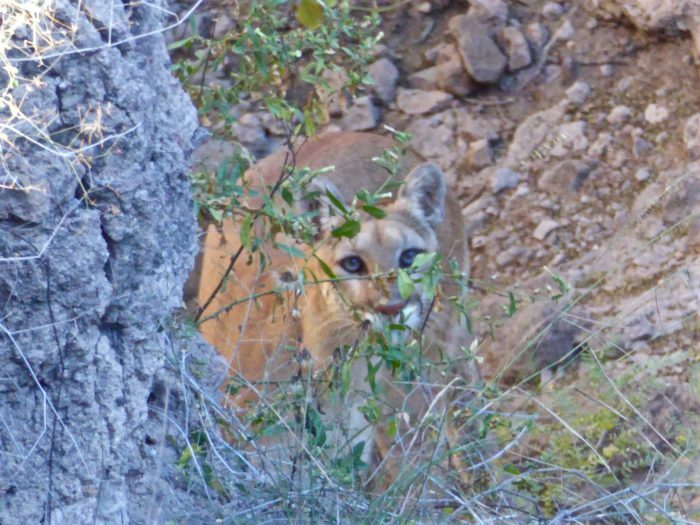 Several deep canyons add an air of mystery to the sanctuary and afford maximum privacy as you explore our extensive and well-groomed Nature Trails. This rich land supports an impressive level of biodiversity – a subset of the species present in the Sky Islands as a whole. Our Woodlands and Grasslands boast a diverse flora, including many edible and otherwise useful species, attracting a broad spectrum of wildlife. 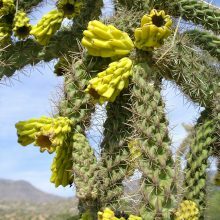 Some of these are tropical plants that barely enter the U.S. For example, nectar-feeding Bats are drawn to the sweet blooms of Palmer Agave, while Collared Peccaries dine upon Prickly Pear pads and fruit. 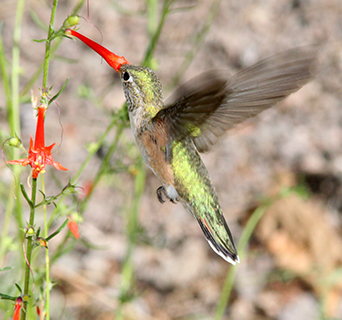 Meanwhile a variety of Hummingbirds investigate colorful wildflowers in search of a quick meal. 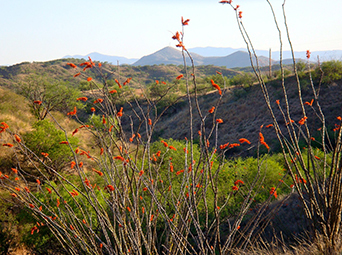 Gorgeous seasonal wildflowers punctuate late Winter/early Spring as well as Summer/Autumn, adding color to an already stunning landscape. Southern Grasshopper Mouse – a predatory species that eats other Mice! 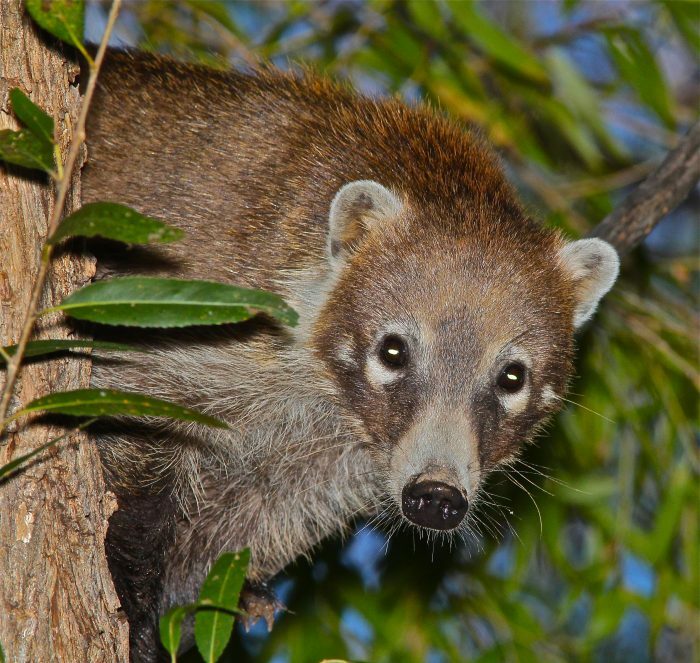 …..and a diversity of smaller species – many more typical of Mexico. Ornate Box Turtles wander amidst the lushness of monsoon season, while a diverse assemblage of Lizards will tempt you into closer viewing. 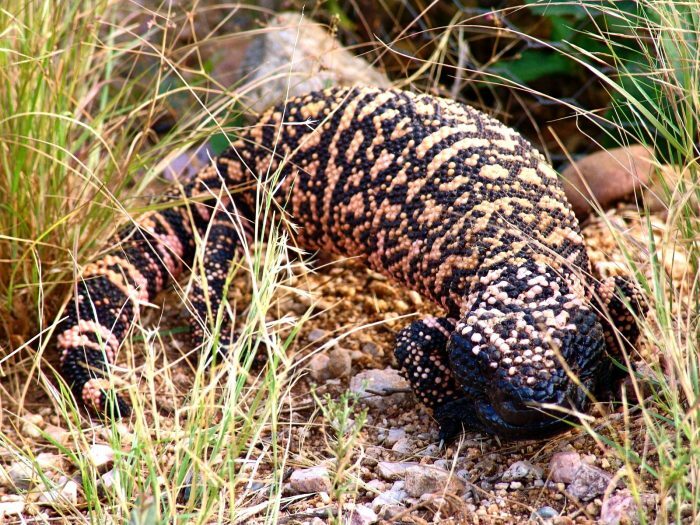 One species of Whiptail Lizard here amazingly consists only of females! Invertebrates at Raven’s Nest Nature Sanctuary are legion, yet we’re almost entirely lacking in biting flies or mosquitos! 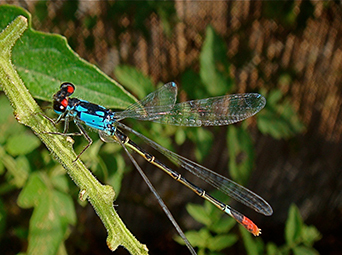 We do have flies (Robber Flies) that eat Paper Wasps, Wasps that consume Tarantulas, and Tarantulas that can eat Lizards… you get the idea! 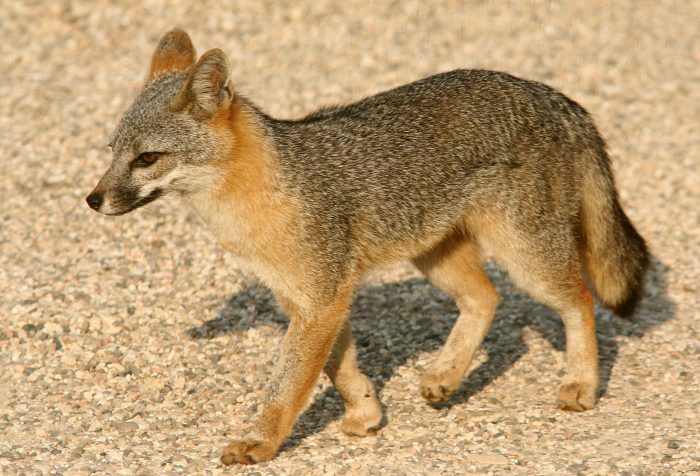 We encourage a deep appreciation of all species great and small at our Nature Sanctuary. Each has a vital role to play in our ecosystem. 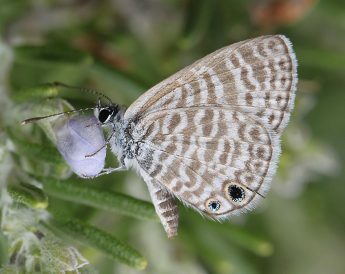 Invertebrates, for example, often help support the larger “flashier” species of wildlife – either directly as food or as plant pollinators. 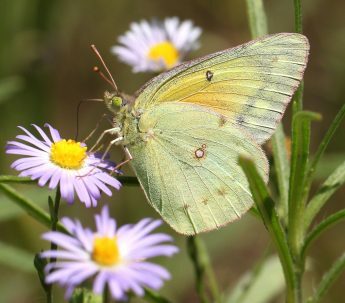 On August 28, 2016 a Butterfly Survey conducted within Raven’s Nest Nature Sanctuary recorded 47 species. 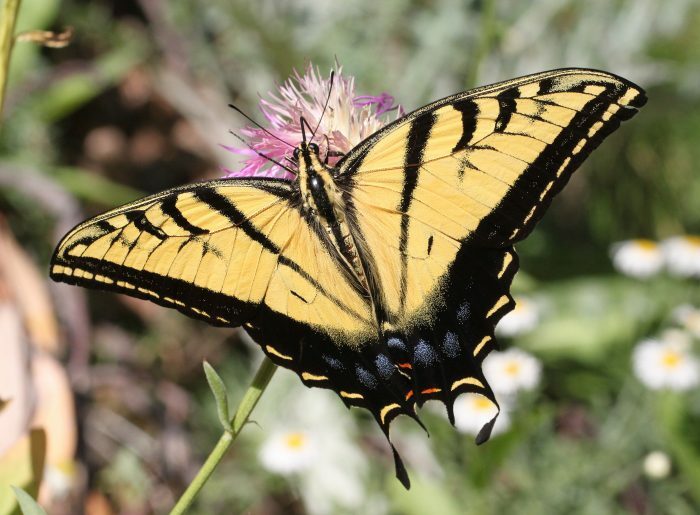 To view the Raven’s Nest Butterfly List as of that date please click: PDF. 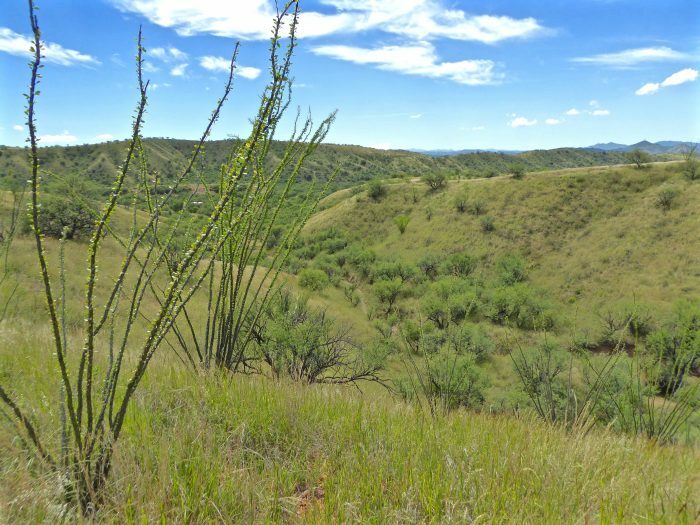 Many additional species may be found as well at our Nature Sanctuary, given the diversity of our plant communities as well as the proximity of Sonoita Creek State Natural Area’s 9,000 acres of wilderness. 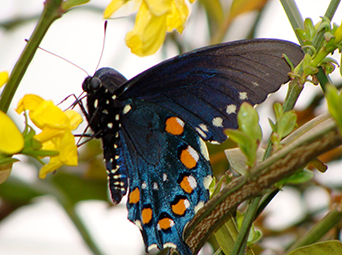 We have planted hundreds of native plants since our arrival in 2008, helping to support our Butterfly diversity. 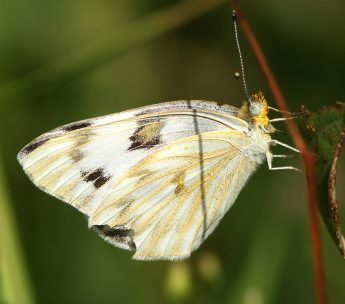 Over 133 species are included on the list of Butterflies for nearby Sonoita Creek State Natural Area & Patagonia Lake State Park. 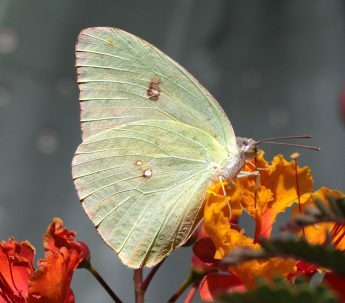 Please let us know if you would like to arrange a custom-made Butterfly Safari with us! Set amidst the resplendent beauty of Nature, the accommodations and facilities at Raven’s Nest Nature Sanctuary are designed to maximize your opportunities for relaxation, learning, and exploration. Whether you take a Sky Islands Nature Adventure with us, stay at our unique Safari Tented Camp Eco-lodge, or come along on a tour of our Raven’s Nest Nature Sanctuary, we want for you to always be comfortable and enjoy the amazing luxuries afforded at our unique Glamping site. 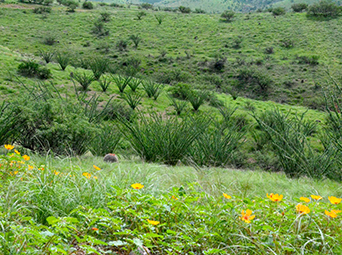 We’ve built all our facilities in an Eco-friendly fashion – always striving to benefit the land, as well as our guests. 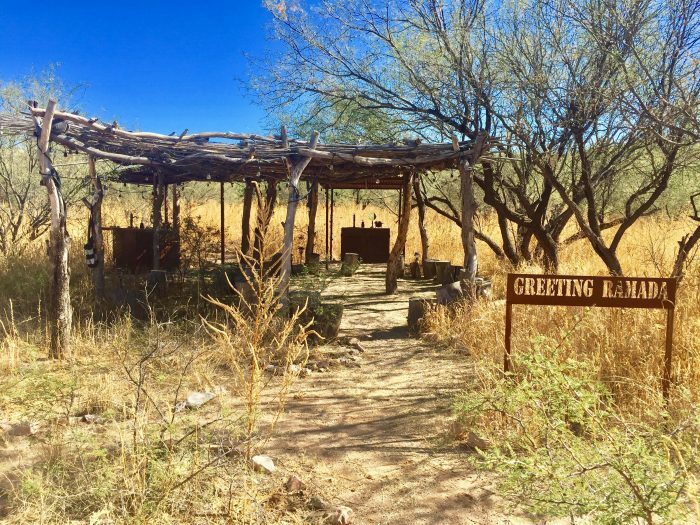 We want to provide romantic couple’s retreats, unique family nature adventures, and memorable group events with a very unexpected level of luxury at our remote Nature Sanctuary! Guests from all over the world always praise the fact that we exceeded their expectations, as they find Raven’s Nest to be a wonderfully wild, beautiful, and fun place to be. Here they enjoy amazing luxuries while in the embrace of the Earth at our unique Eco-lodge – located by over 9000 acres of pristine and remote wilderness. 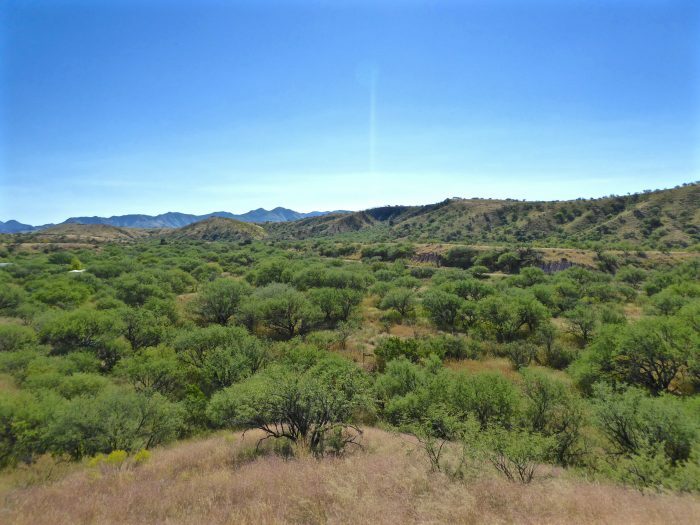 Your stay with us will be enhanced by the songs of countless birds, the haunting call of a Gray Hawk, the raucous cacophony of cavorting Ravens, and other wild sights and sounds. 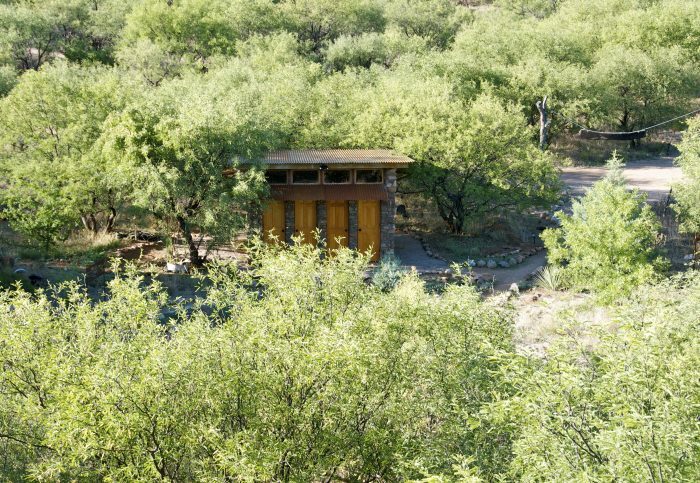 All this and more as you enjoy a unique, private, and secluded Nature retreat. 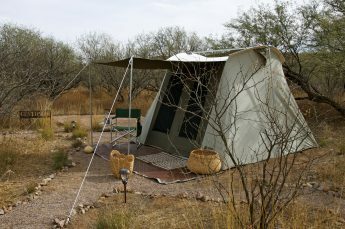 Your overnight Glamping experience will be enriched by our Astronomy Program, the iconic songs of the howling Coyotes at dawn and dusk, the hooting of our resident Great Horned Owls, and the morning chorus of innumerable birds. A memorable multi-course dining experience – Al fresco under a blazing sunset and then the stars – will include seasonal wild delicacies and organic produce from our gardens and orchard. Savoring gourmet food surrounded by the peace and majesty of Nature is truly an unforgettable experience! 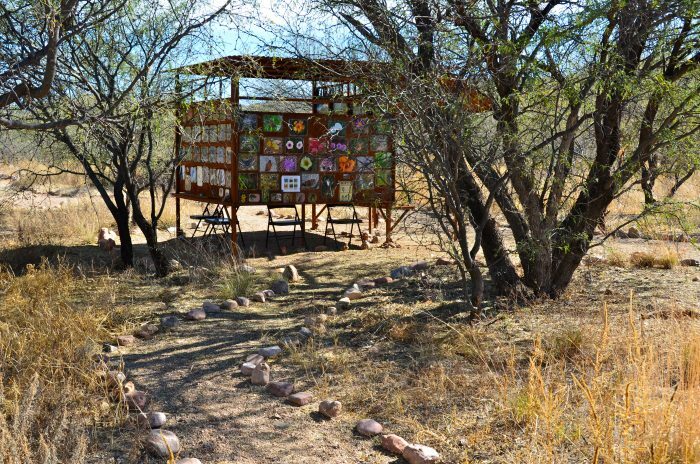 Guests at Raven’s Nest Nature Sanctuary have 24-hour access to our 2000 sq. 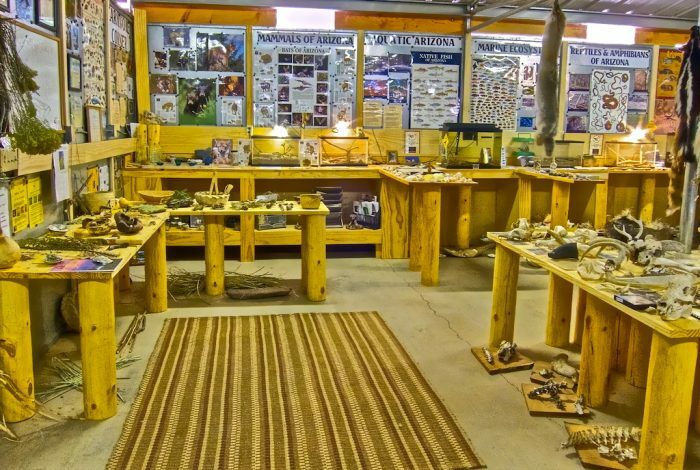 ft. Sky Islands Discovery Center – full of educational and informative Natural History and Wilderness Survival displays. 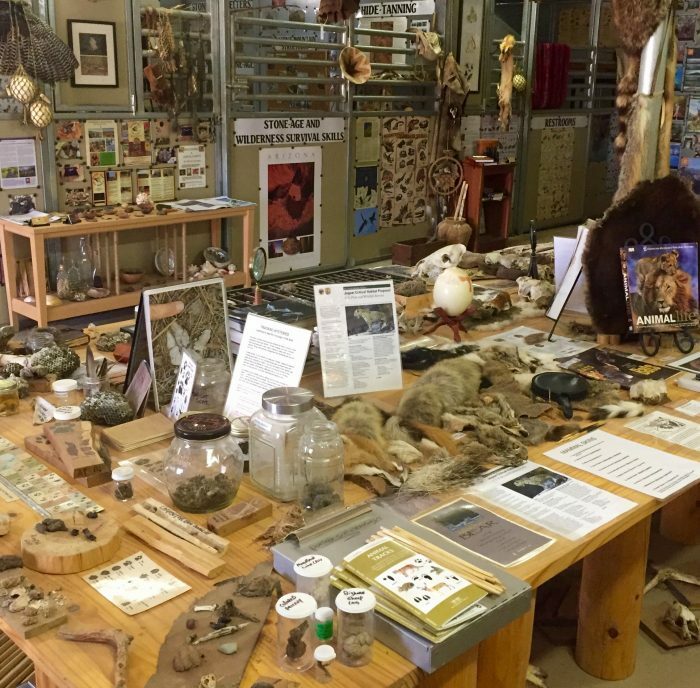 Given his extensive experiences at other Nature centers throughout the U.S., Wildlife Biologist and Naturalist Vincent Pinto has created a hands-on museum, highlighting the biodiversity of the Sky Islands. No matter how many times you wander the Discover Center, you always learn new and fascinating facts about Sky Islands flora and fauna! 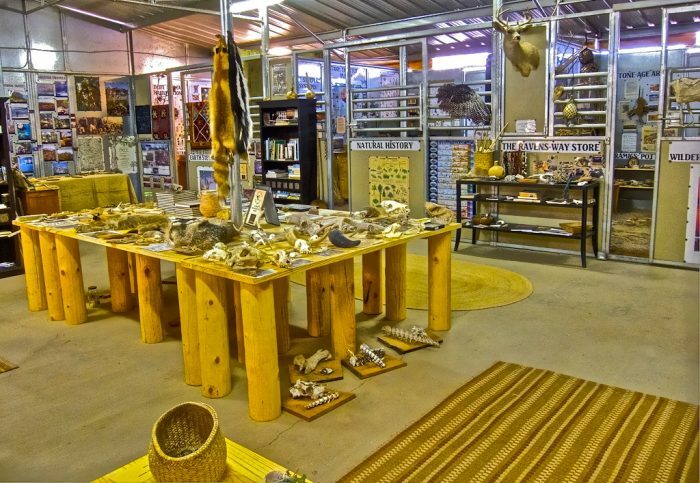 The Discovery Center is a treasure trove full of beautiful and educational displays, showcasing the dazzling biodiversity of the southeast Arizona. 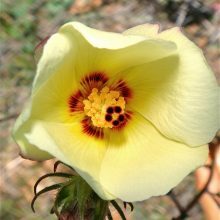 Whether you are an experience naturalist or relatively new to our area, you’ll enjoy seeing and learning about our unique flora, fauna, and ecology. We hope to inspire you to help protect the many wild species that we are so fortunate to have in the Sky Islands Region. 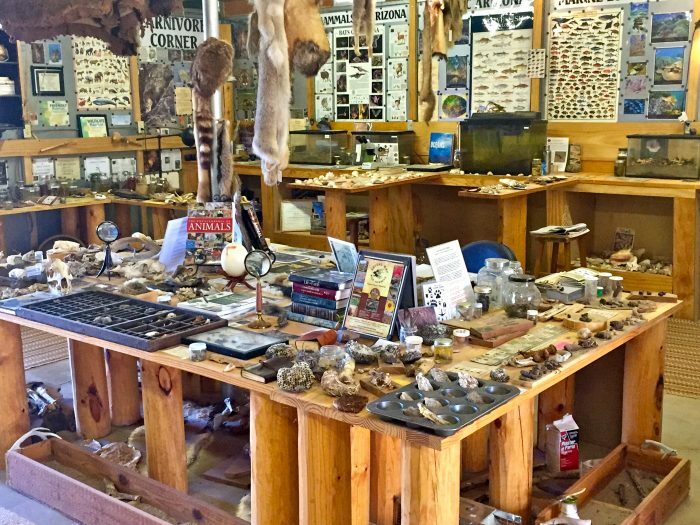 The numerous interpretive displays in the Sky Islands Discovery Center will inspire you to seek the flora and fauna of Raven’s Nest Nature Sanctuary while you are exploring outside and enjoying over 5 miles of groomed trails. 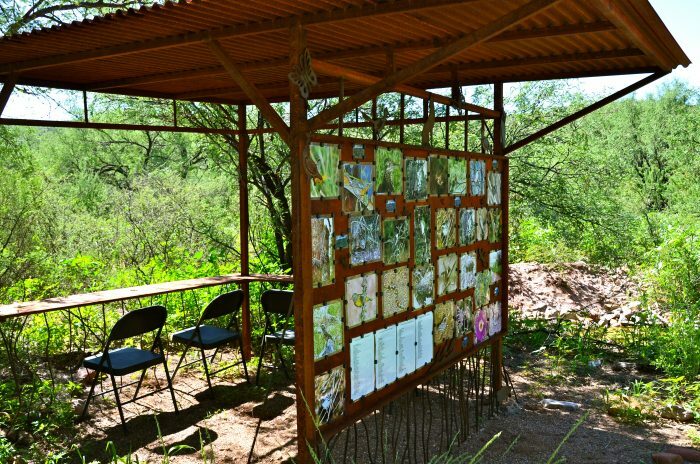 The displays will also help you to understand the intricate ecology and biodiversity of this unique region. 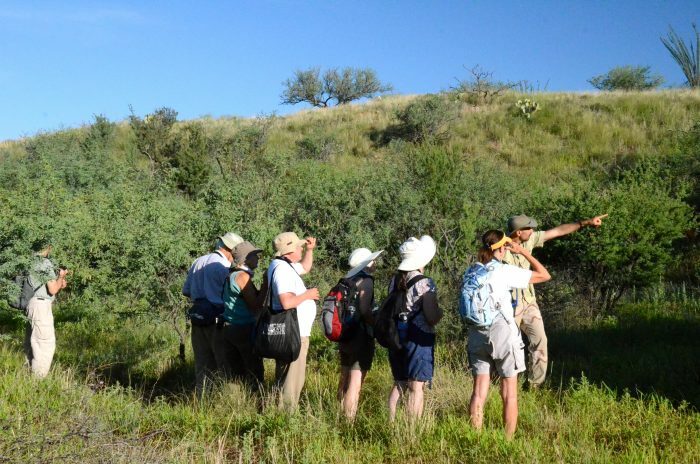 At Ravens-Way Wild Journeys we strive to raise awareness via experiential education, always helping you to better understand and protect our amazing Sky Islands biodiversity and fragile natural resources. 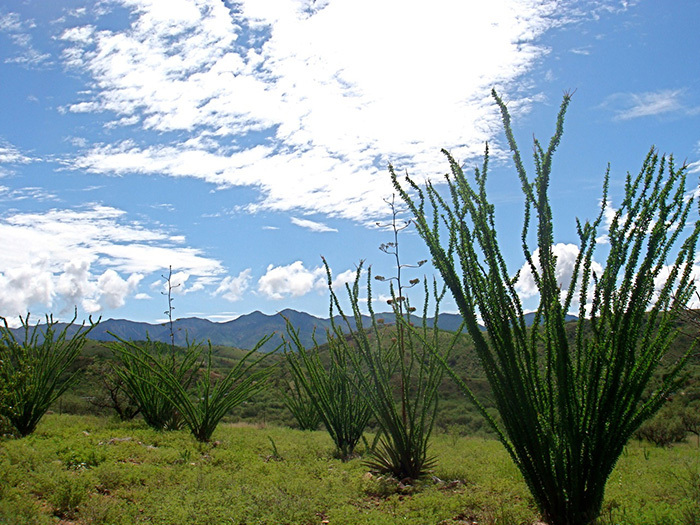 Therefore common themes woven into our Eco-Lodge are our Earth Stewardship and Eco-friendly practices. 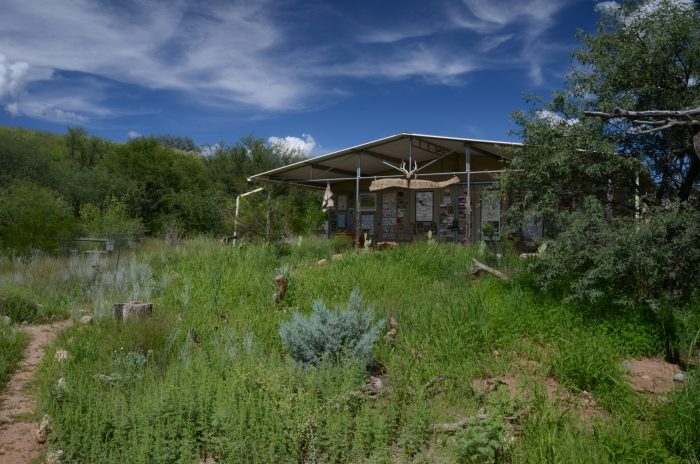 At Raven’s Nest Nature Sanctuary we are always looking for opportunities to practice green living, helping to conserve key resources like water and energy. We’ll be happy to give you an Eco-tour highlighting our legion of environmental practices such as our gray-water irrigation systems, our ongoing rehabilitation of native habitats, removal of non-native species, passive and active rainwater harvesting projects, ongoing native plantings, Xeriscape gardens, and our ADOPT-A-TREE initiative. Despite persistent rumors to the contrary, we do indeed have distinct seasons in the Sky Islands – 6 in fact! 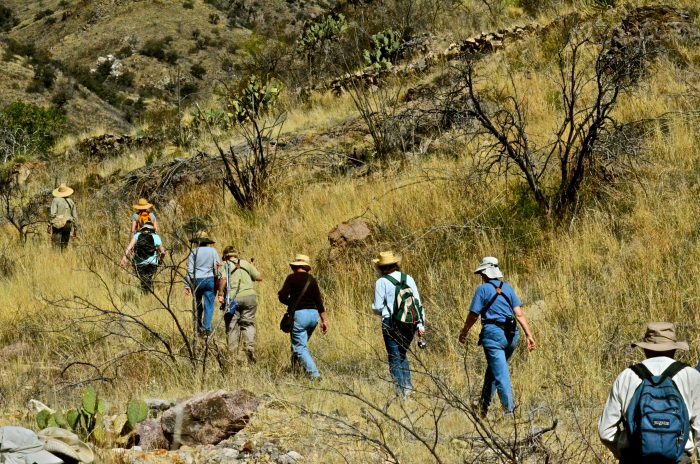 Based at 4000 feet in elevation, Raven’s Nest Nature Sanctuary affords you a wide range climatic of choices for your vacation or retreat. All of our seasons have their charm and we’ll help you decide when exactly to visit the Sky Islands. 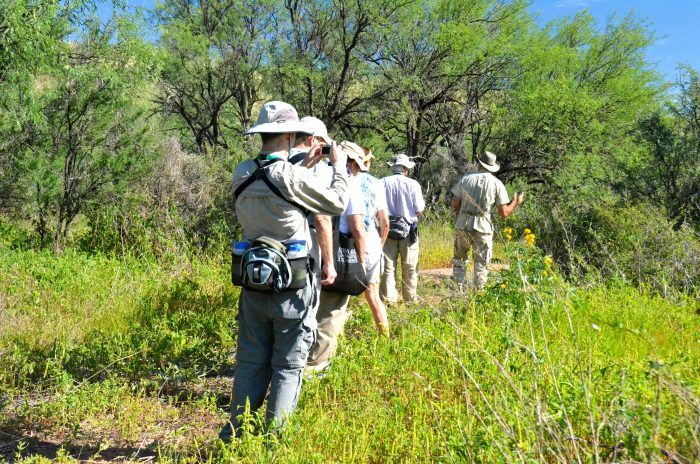 Exciting Birding and Nature Adventures are offered all year long and we are happy to tailor an experience to meet your exact needs and preferences! Starting in December, we often receive cooler weather heralding in our mild Winter season. In late December our daytime highs range from the mid 60’s to low 70’s, with nighttime lows in the high 20’s to high 30’s. 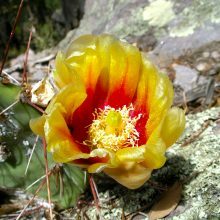 Gentle Winter rains occasionally pervade the region, especially during an “El Nino Winter”, leading to sometimes spectacular wildflower displays during Spring. Rarely, we have enjoyed a great winter surprise at Raven’s Nest Nature Sanctuary – a welcome and delightful dusting of snow in December – generally gone by noon. In January sunny days with blue skies are the norm at Raven’s Nest Nature Sanctuary. Our daytime highs average around the mid 60’s with nighttime lows ranging from high 20’s – mid 30’s. Gradually the temperatures increase daily. February is usually very sunny with daytime temperatures in the high 60’s or low 70’s – very pleasant for Winter – with nighttime temperatures in the low – high 30’s. Starting anywhere from mid-February to the end of March or so we often have a relatively lush Spring. 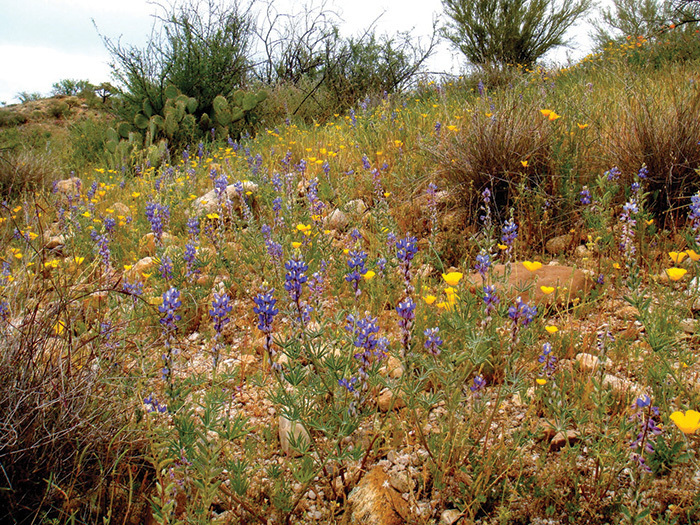 The occasional rains of Winter may continue even into May in some years, while dozens of species of wildflowers carpet Deserts and Grasslands alike. Temperatures in March fluctuate from the mid – high 70’s during the day and the high 30’s – low 40’s at night. Generally around mid-to-late April the possibility of receiving any rain starts to abate, marking the beginning of our Dry Spring. 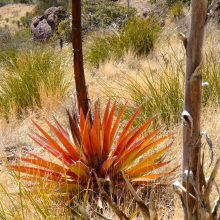 Temperatures now often reach the low 80’s during the day, though our characteristic aridity makes these days feel quite pleasant. Nighttime temperatures range mid 40’s to low 50’s. In May our daytime highs reach the high 80’s, with nighttime lows in the mid – 40’s to high 50’s’. 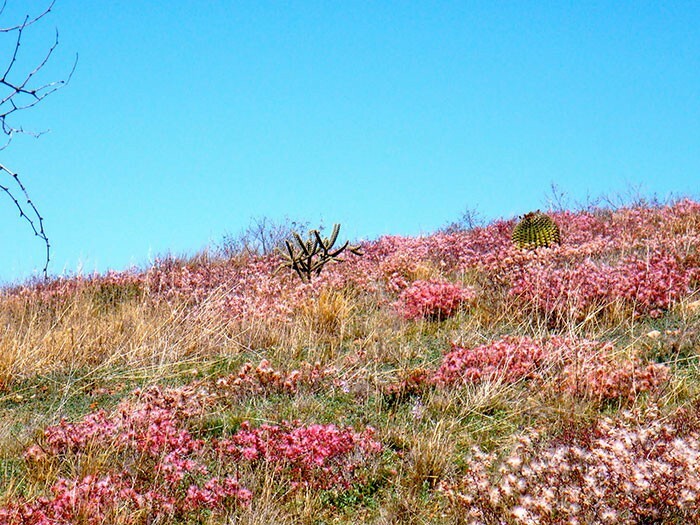 April and May are peak spring migration times for many bird species and, along with lingering wildflowers, provide a serious glimpse into our fabled Sky Islands biodiversity. Late May through June generally see daily highs in the 90’s or, rarely, the low 100’s. Again, drier conditions and cooler nights with temperatures in the mid 60’s – mid 70’s make such days quite tolerable. 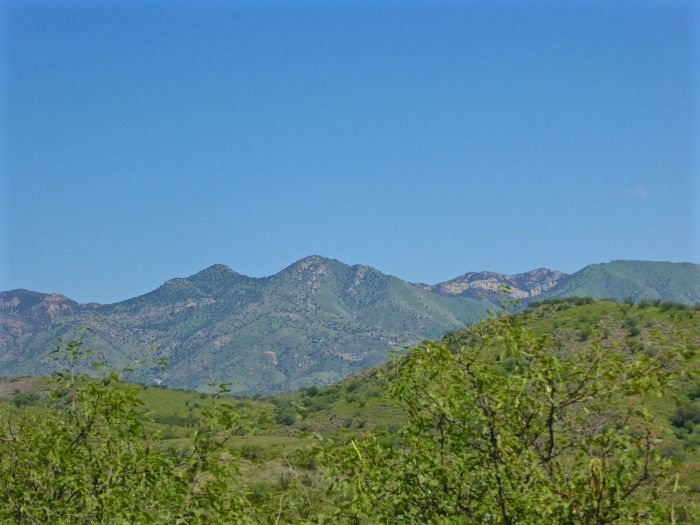 Frequent trips to gorgeous nearby mountain ranges provide glimpses into our amazing biodiversity and cooler daytime temperatures. At the end of June and the beginning of July we usually start to see a significant rise in our humidity levels, which, along with the continued high temperatures, lead to building storm clouds. This is the beginning of the Monsoon season or Wet Summer! 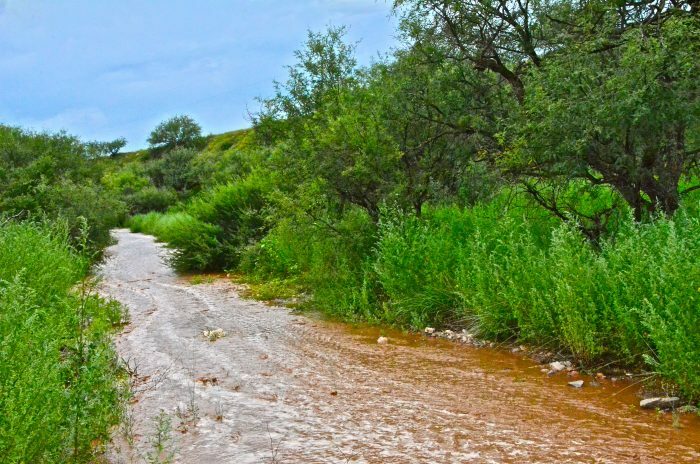 The arroyos at Raven’s Nest fill periodically with much anticipated rain and slowly our gorgeous Nature Sanctuary turns lush, green, and abundant! From about July 4th through the end of September we often have conditions conducive for brief, though sometimes significant and beautiful thunderstorms. It is now that life – both plants and wildlife – truly begin to flourish in the Sky Islands! In July our daytime highs reach the high 80’s to the high 90’s, with nighttime lows in the mid to high 60’s. Daytime highs during August, the peak of Monsoon season can vary quite a bit from hotter days reaching into the 90’s to other periods where 80’s are more the norm. 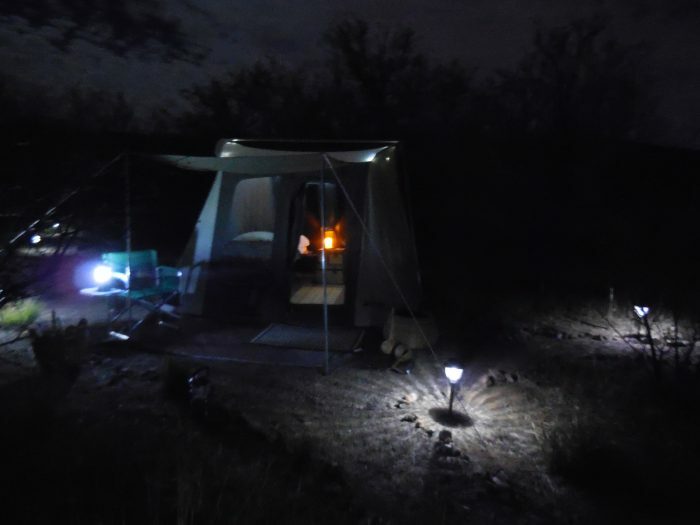 Nighttime lows in the Safari Camp usually hover around mid – high 60’s – very pleasant sleeping weather. Each storm or cloud cover brings with it very amenable, cooler temperatures. 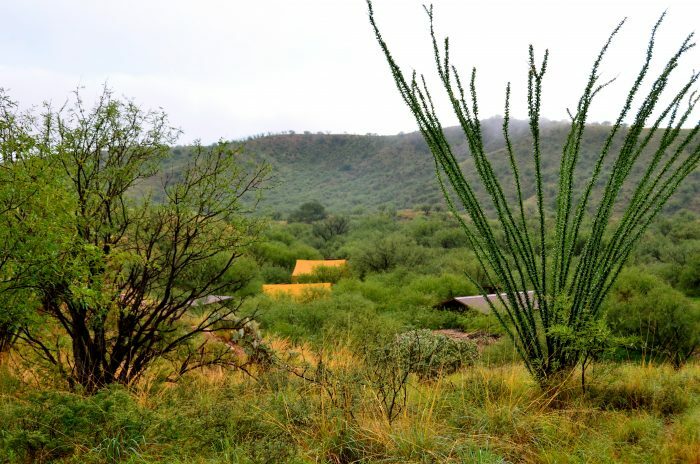 Guests are often pleasantly surprised at the lushness and beauty our monsoon season! 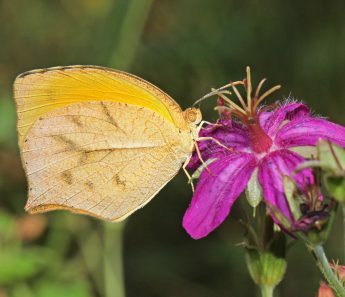 Peak fall migration occurs in August and September for many bird species, while summer wildflowers lend their beauty to an already lush season. By the beginning of September, daytime highs settle into the mid 80’s to low 90’s with night temperatures in the low to mid 60’s. By the end of September temperatures usually settle into the high 80’s for daytime highs, while nights range from the high 50’s to mid 60’s. 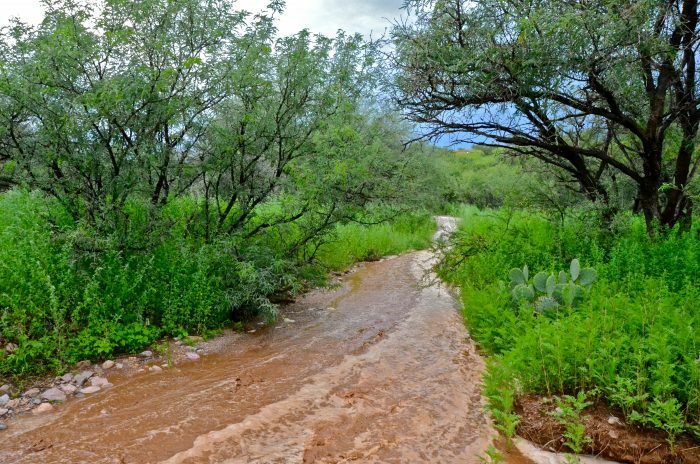 The lushness of Monsoon season is still in evidence! 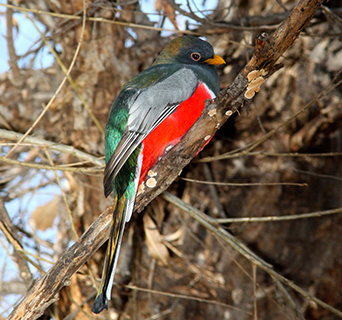 Nesting birds – some on their second or third nest! 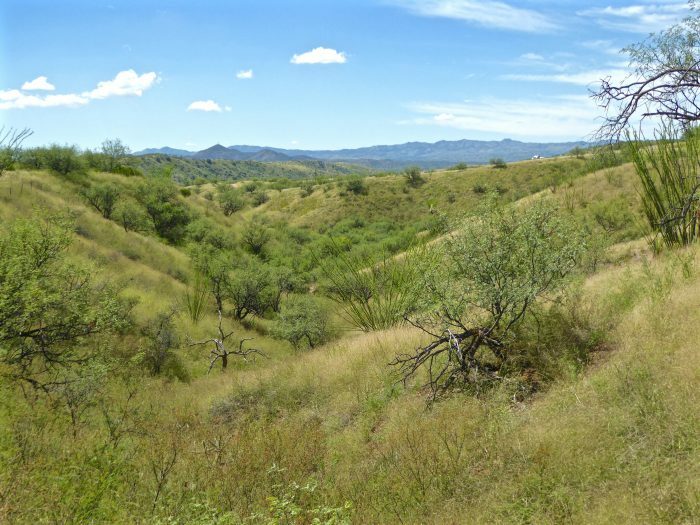 During an abundant Monsoon season the amazing lushness is still in evidence at the beginning of October, when a few late storms may add to it. October is a beautiful month with more stable and predictable weather, as rains cease to enter our area. Daytime temperatures usually settle between the low – mid 80’s, while nights range from the mid – high 50’s. November is often our driest or second-driest month and can experience rather large temperature swings. Early November daytime temperatures usually settle between the high 70‘s -low 80’s, while nights range from the mid 40’s – mid 50’s. Thanksgiving temperatures are in the low 70’s, while nights range from the low to mid 40’s. December is often our coolest month and along with November can experience rather large temperature swings. Guests should come prepared to experience a drop in temperature overnight during late Fall through early Spring. 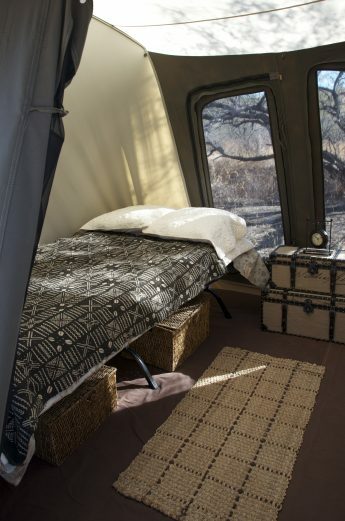 Your Safari Tented Camp is appointed with a Sleep Number bed and includes an electrical blanket as well as portable heaters to ensure a very cozy overnight experience. 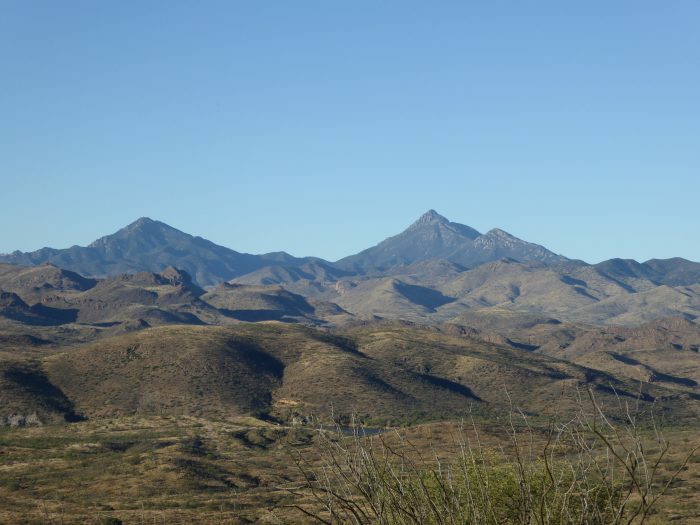 Daytime temperatures in southern Arizona are often the most pleasant in the entire U.S.! Once your reservation is confirmed and we receive your deposit and registration documents we will send our suggested packing list. The season best suited to your visit of course depends on many factors. What time slots do you have available? What are your goals for the trip? What’s the climate like at your own home? 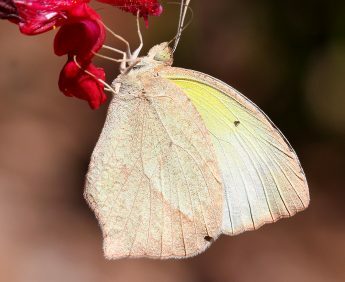 What type of wildlife and flora would you like to see? Would you like to schedule any Nature Adventures with us? Talk with us and we can help you to sort it all out! 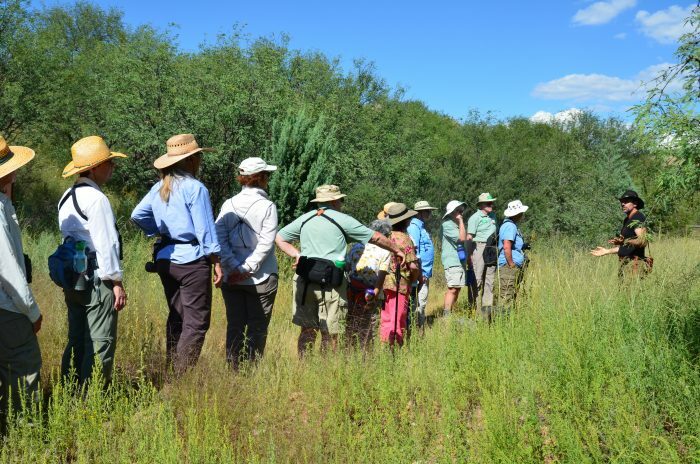 In addition to our Safari Tented Camp Eco-lodge, RWWJ offers groups several other options for overnight stays at Raven’s Nest Nature Sanctuary. 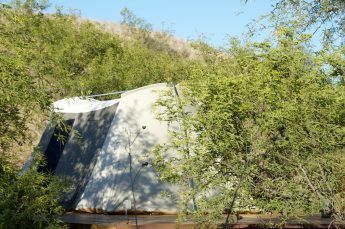 For large groups and families who would like to enjoy a Glamping experience with luxury beyond conventional camping, we offer our gorgeous Expedition Tents at Main Camp. 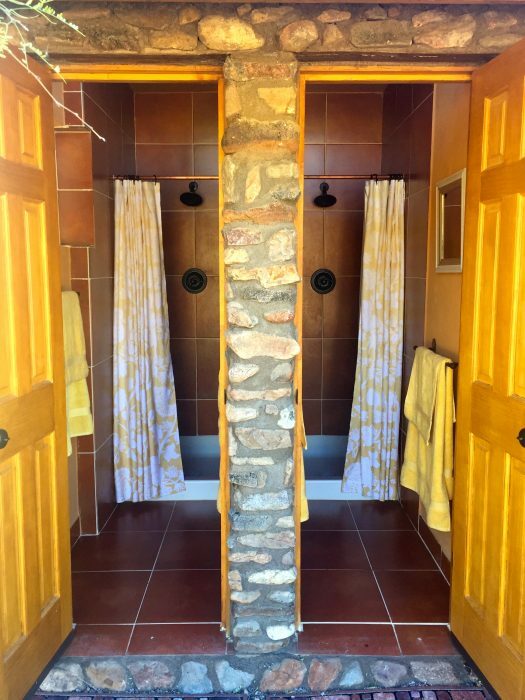 You can enjoy a beautiful indoor hot shower at Nighthawk Nook, which have been designed as a gray water system. 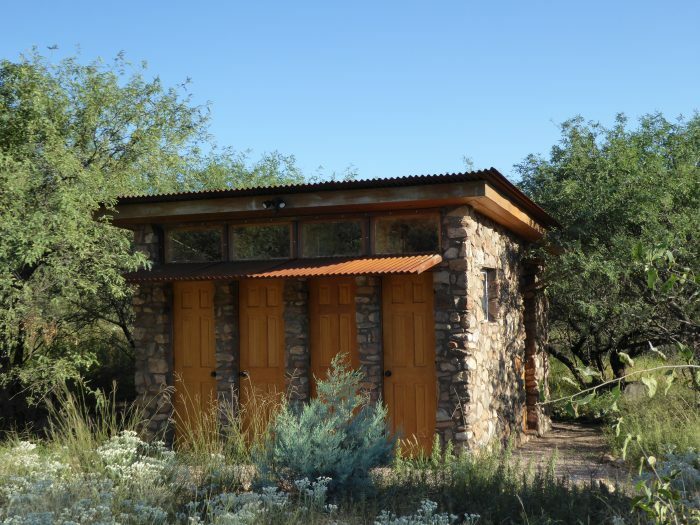 The used water from the 4 showers benefits the native trees around the stone building. 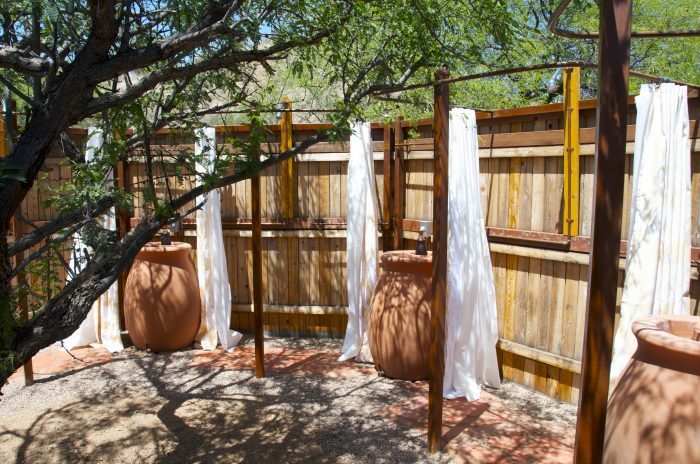 Alternatively, you can enjoy one of our 7 outdoor solar showers at Main Camp which are also water the beautiful Mesquite trees. We treasure our well water and are passionate about reusing it at every sink and shower in our environmentally minded Eco-Lodge. 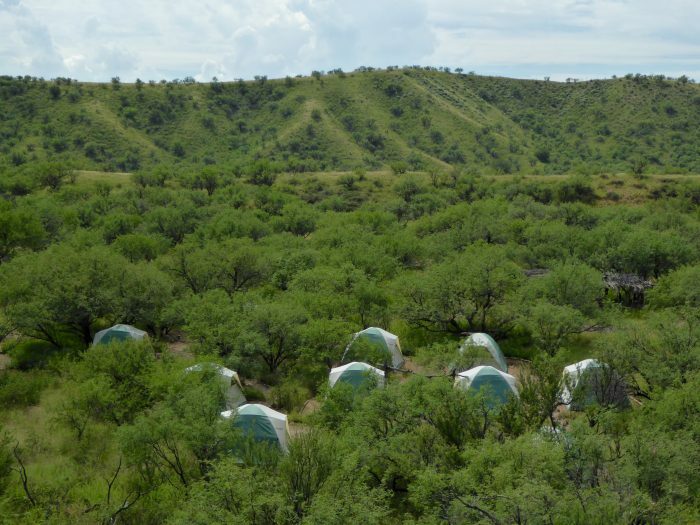 Our Main Camp is remote, quiet and perfect for those seeking an experience in Nature. 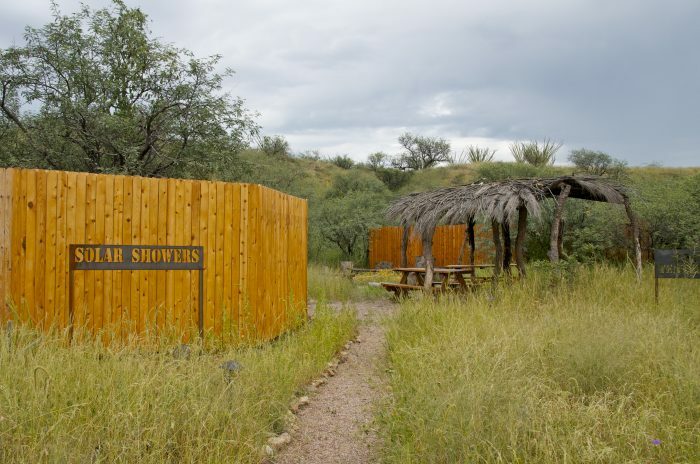 Given the private nature of Raven’s Nest Nature Sanctuary and the quality experiences it provides for our guests we always require advance notice of at least 2 weeks and confirmed reservations to stay in any of our accommodations: the Safari Tented Camp Eco-lodge, our Expedition Tents, or for conventional camping. Just e-mail us and we’ll be happy to help you plan a memorable stay with us. 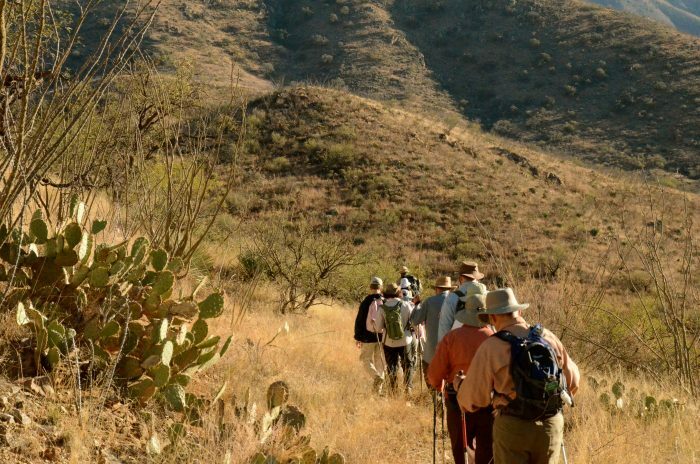 Rates will depend on the size of your group, length of stay, Meal & Nature Adventure choices, and time of the year when you are planning your Nature retreat . 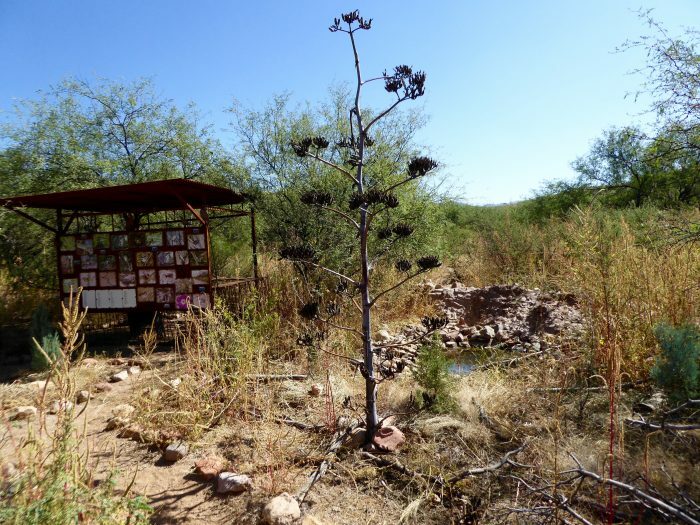 For Nature lovers, birders, and photographers alike our Bird Blind is strategically located by a wildlife pond fed by our Rain Water Harvesting system. 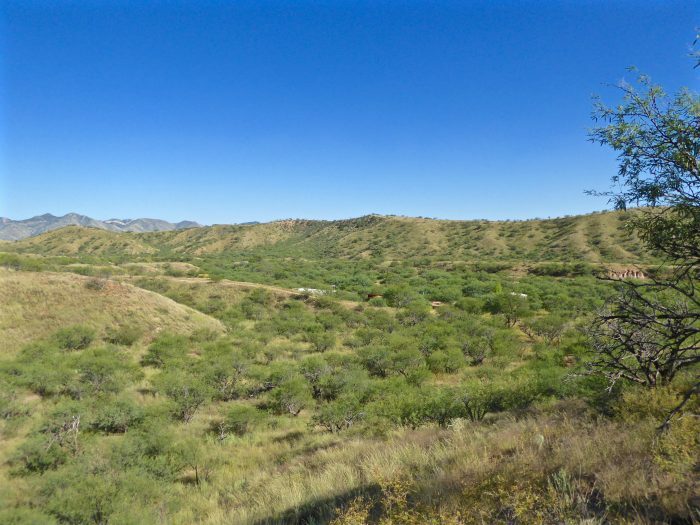 There you can relax and wait for the arrival of numerous bird species, Collared Peccaries (Javelina), lizards, and other wildlife. The blind has photos of our resident and migrant species as well as our Bird & Wildlife Lists, which can guide and inspire you in your quest to see and enjoy wildlife. One critical distinction of our Main Camp is that we never mix different groups. Thus, if you stay with us for a few nights, you have Raven’s Nest Nature Sanctuary for yourself or your group! This in in stark contrast to the often loud and unruly public campgrounds that abound elsewhere! 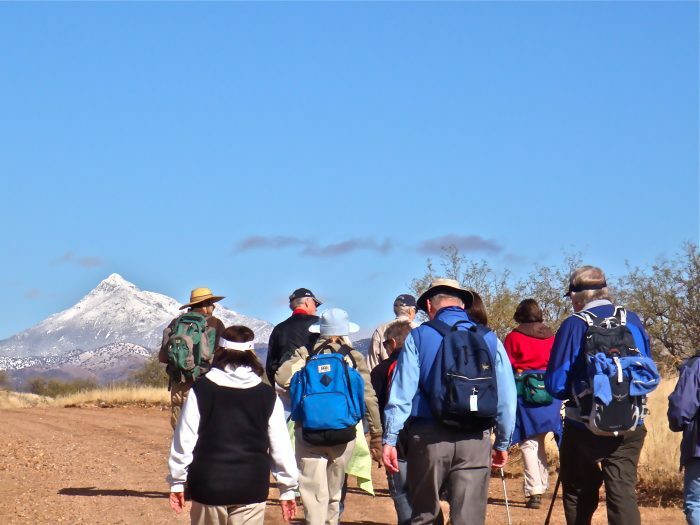 Over the years we have been very fortunate to develop very solid and rewarding Education Partnerships with several Universities, Colleges, International Organizations, and Outdoor Schools (including NOLS, the National Outdoor Leadership School) among others. We welcome groups at our Check-In Kiosk, conveniently located by an ample and well-lit parking lot and nearby our Greeting Ramada. 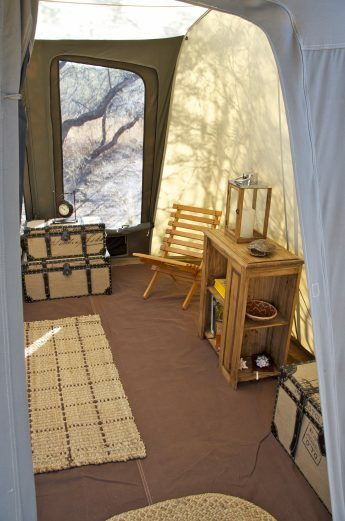 Our Main Camp can accommodate groups of up to 30 people, if we are given ample advance notice. This allows our dedicated staff to set up each tent in a well marked and lit camping pad. Large, 6-person Eureka tents are set up per person to ensure maximum convenience for our student groups. 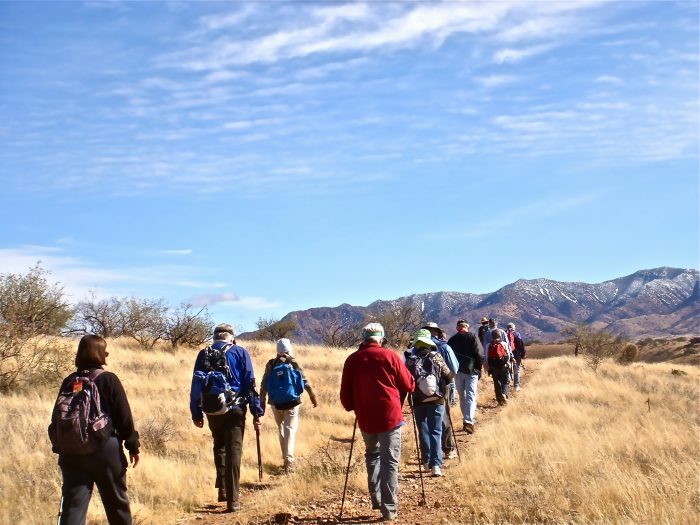 Our marked and groomed trail system provides 5 miles of walking trails to our guests with a range of difficulty that will satisfy most tastes. 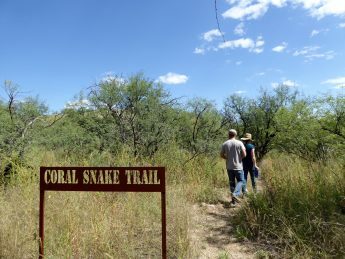 You can also enjoy Lizard Labyrinth for Walking Meditations as a perfect way to take in the peace and beauty of Raven’s Nest Nature Sanctuary. 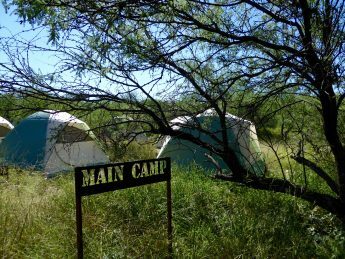 Alternatively, Students are also welcome to bring their own tent, and their food during their stay at Main Camp and focus on enjoying learning via our diverse and unique Programming. 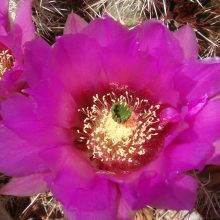 For details about about Nature Adventures, Wilderness Survival, or Astronomy Programs -Click here for NATURE ADVENTURE. Just let us know what your Organization is interested in and we’ll be happy to accommodate your requests and tailor a very unique learning experience to suit your preferences and budget! 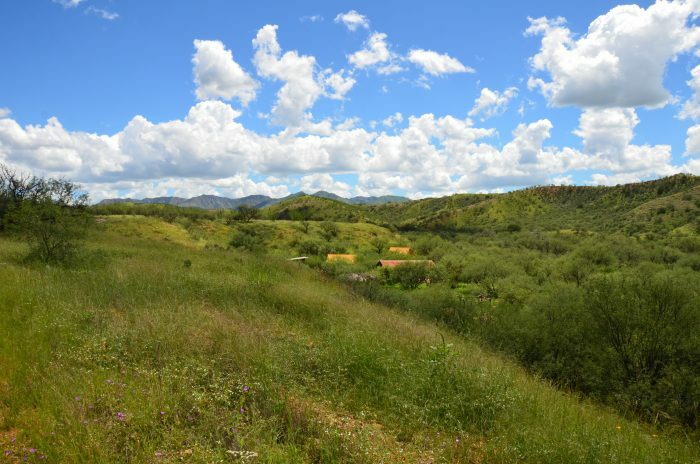 Raven’s Nest Nature Sanctuary is perfectly located near a wide range of recreational opportunities that are sure to enhance your Sky Islands experience. 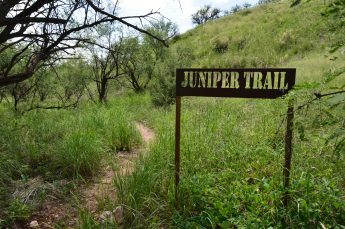 If you’re craving to explore a variety of wild areas – each unique in what it has to offer – then you’re definitely in the right place! 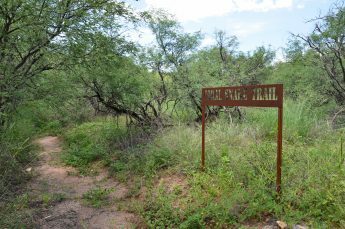 A short walk from us is Sonoita Creek State Natural Area with 9000 wild acres to explore. The lists of plants and animals there, though overlapping with those of our Nature Sanctuary, are amazingly different despite the close proximity of the two. 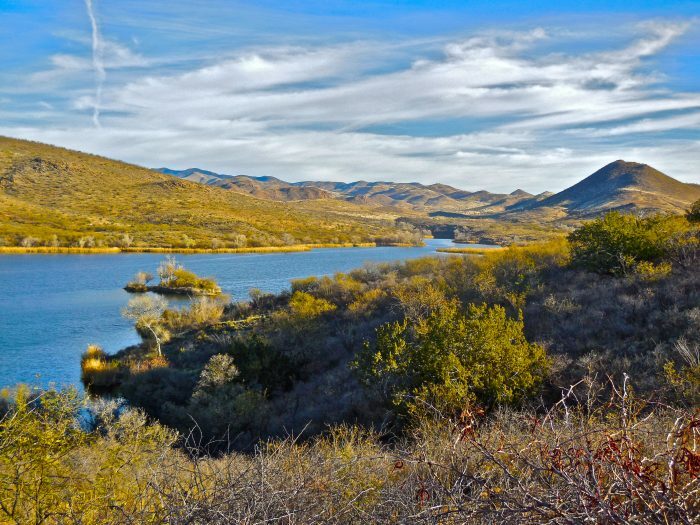 Adjoining the Natural Area, Patagonia Lake State Park presents incredible birding and wildlife viewing opportunities and lies a mere 5 minute drive away. 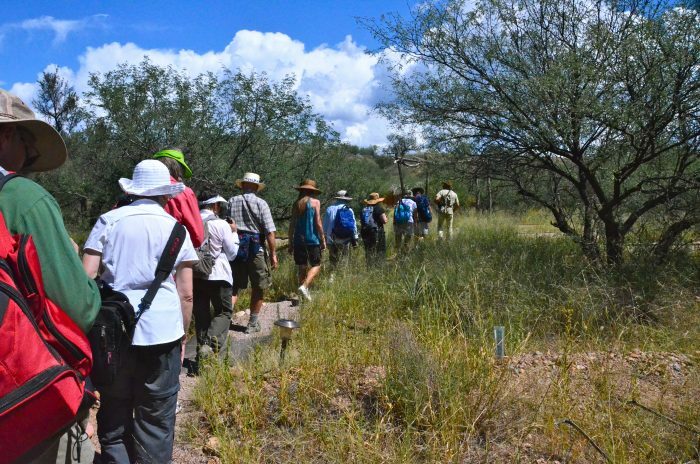 Those of you craving a bit of modern culture and more recent history or just a night out on the town will enjoy the many choices presented by Tucson. 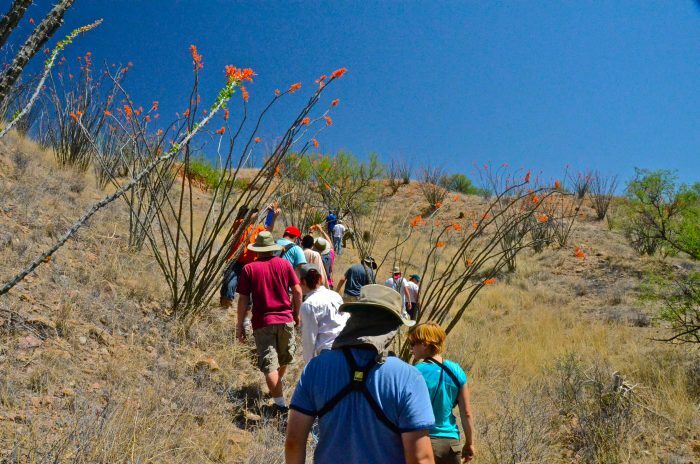 Fine dining, cinema, and the arts await you in the “Old Pueblo”. 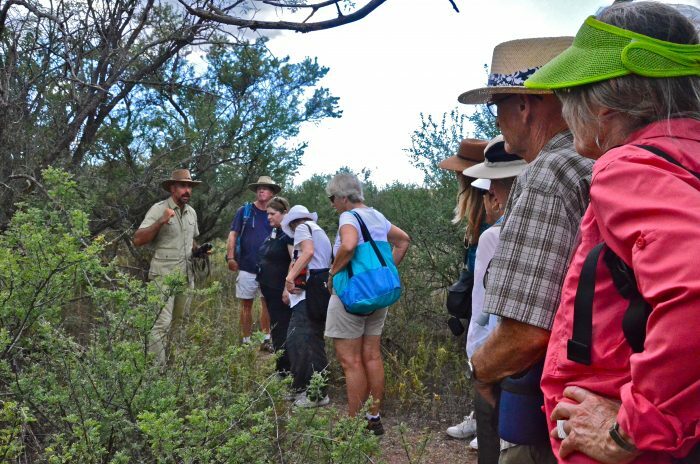 Closer to Raven’s Nest, the quaint towns of Patagonia and Tubac offer their own culinary rewards, as well as some first-class shopping. 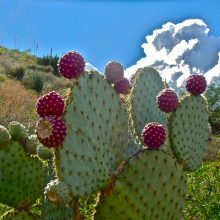 In Tombstone and old Bisbee you’ll find the western culture, fine food, as well as plenty of antiques for you to peruse. Numerous other renowned Natural and Historic sites lie within the Sky- Island Region and are well worth exploring. 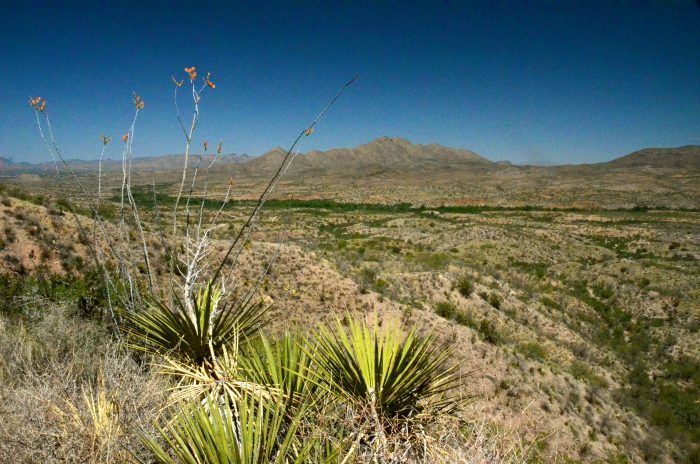 We will be happy to guide you within these areas, always endeavoring to enhance your stay in the Southwest. Let Raven’s Nest Safari Tented Camp or Main Camp be your base of operations as you delve into the timeless magic of the Sky Islands. Join us for a unique wilderness experience. We look forward to welcoming you as our guest for an unforgettable vacation or retreat. Disconnect from the constant hustle and bustle of big cities and everyday life and instead immerse in Nature, enjoying our one-of-a-kind Sky Islands!